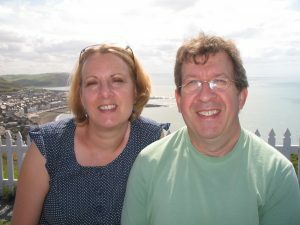 Three years ago today Sue, my wife of 32 years went to be with her Lord and Saviour Jesus Christ. I have absolutely no doubts about where she is, so she isn’t lost. She has joined that happy holy Blood Bought throng to praise God without the burden of a sinful nature. I hesitate to say she has died and I still balk at saying j have lost her. I’m thankful to my friend Pastor Robert Briggs. He told me three years ago that ‘my own personal walk with God would get me through.’ He was absolutely right. Not that I take credit, but rather give glory to the keeping power of Christ. I have a small group of friends that have stuck by me over the years. I’m thankful for them. And I give thanks to God for my children, grandchildren, and family and for Sandra. My testimony is that God has been utterly faithful and has continued to bless me, unworthy as I am, over these past three years. He has kept me and has preserved me. His Mercy’s are new every morning. Great is Thy faithfulness Lord to me! The fact is we will ALL leave this life and enter eternity. That eternity will be a world of unutterable joy with Christ or a world of unutterable misery without Christ, again in the presence of Christ, but Christ the Judge. As Joshua said ‘…. choose this day whom you will serve…. But as for me and my house, we will serve the LORD.” Joshua 24:15. 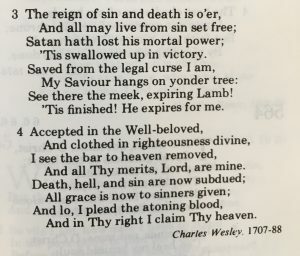 This hymn came to my mind this morning about the death of Sue and for every Christian. H. A. Cesar Malan, 1787 – 1864 (?). Translated by: George W. Bethune, 1805 – 62 (?). Read this together last evening. Sometimes Mr Spurgeon just really hits the spot. Be aware believer you have everything In Christ. Be aware unbeliever you have nothing outside of Christ. Look at thy possessions, O believer, and compare thy portion with the lot of thy fellowmen. Some of them have their portion in the field; they are rich, and their harvests yield them a golden increase; but what are harvests compared with thy God, who is the God of harvests? What are bursting granaries compared with him, who is the Husbandman, and feeds thee with the bread of heaven? Some have their portion in the city; their wealth is abundant, and flows to them in constant streams, until they become a very reservoir of gold; but what is gold compared with thy God? Thou couldst not live on it; thy spiritual life could not be sustained by it. Put it on a troubled conscience, and could it allay its pangs? Apply it to a desponding heart, and see if it could stay a solitary groan, or give one grief the less? But thou hast God, and in him thou hast more than gold or riches ever could buy. Some have their portion in that which most men love-applause and fame; but ask thyself, is not thy God more to thee than that? What if a myriad clarions should be loud in thine applause, would this prepare thee to pass the Jordan, or cheer thee in prospect of judgment? No, there are griefs in life which wealth cannot alleviate; and there is the deep need of a dying hour, for which no riches can provide. But when thou hast God for thy portion, thou hast more than all else put together. In him every want is met, whether in life or in death. With God for thy portion thou art rich indeed, for he will supply thy need, comfort thy heart, assuage thy grief, guide thy steps, be with thee in the dark valley, and then take thee home, to enjoy him as thy portion for ever. “I have enough,” said Esau; this is the best thing a worldly man can say, but Jacob replies, “I have all things,” which is a note too high for carnal minds. This story on the BBC is typical of a news event used to illustrate spiritual truth. This particular story jumped out as an excellent illustration of salvation. 1. A disaster has taken place. 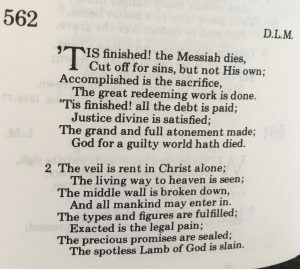 A great verse that speaks to this – and works very well here – is this one: ‘See, this alone I found, that God made man upright, but they have sought out many schemes‘. Ecclesiastes 7:29 (ESV). In other words, man is no longer upright. He has been brought down. Such a mighty glorious vessel now lies helpless on its side. And if memory serves well, the blame was laid squarely on the shoulders of the Captain. The Captain was responsible not the crew or the passengers. The Captain tried to divert blame to someone else but he was found out. At least 30 passengers died when the ship capsized. 2. It needs to be made upright again. For the ship to be made upright it needs help. But it can’t do it, it can’t make itself upright. Help needs to come from outside. In the case of the Concordia there’s going be steel cables attached and host of other engineering equipment needed to bring the ship back to its upright position. It needs salvaging, it needs a rescuer. It needs saving. We need to be made upright and we can’t do it. We can’t help, we cannot contribute, we are helpless. 3. A Rescuer has come. 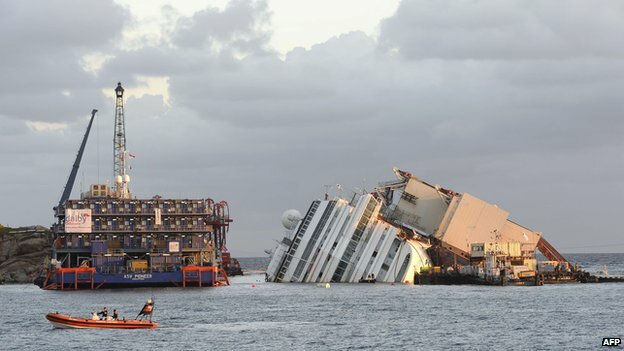 To make the Concodia upright is described as follows: ‘One of the largest and most daunting salvage operations ever undertaken is under way with an attempt to pull the shipwrecked Costa Concordia upright’. I’d disagree with that. The redemption, the rescue of man out of sin is the ‘most daunting salvage operation ever undertaken’. Never was there such a rescue required as the rescue of a sinner. 4. There’s already a hefty price tag, and it’s not over yet. At the end of the report we read, ‘The salvage project has so far cost more than 600m euros ($800m; £500m) and is expected to cost a lot more before the operation is complete’. The planning, the resources and the cost for such an operation is huge. But this is nothing compared to the rescue of a sinner. The salvation of a sinner cost the death of Jesus on the cross. And to get a true perspective of the cost it’s necessary to take some time out and consider just who Jesus is and what it cost to leave heaven, take on the form of a servant and then die. 5. It will be re-floated. It will rise again. As with all illustrations, it’s not perfect. But the following – and final – quote from the news story can be read two ways: ‘Our correspondent says that only after the ship is back up on her keel will it be possible to inspect it fully and begin to plan the next stage – the effort to repair and re-float it – and eventually tow it away to be destroyed.’ Those that have trusted in Christ will rise in Christ to be gloriously re-floated and restored, not just to a former glory but to a greater glory. But for those that have rejected Christ and spurned His cross and His Salvation; they will also be re-floated only to be towed away and destroyed. 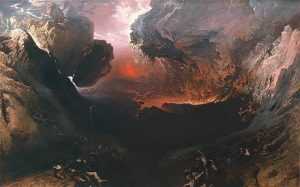 And lest as a Christ rejecting sinner you should think destruction a good thing – when you’re dead you’re dead – the Bible never speaks of destruction as an end of being, but as a loss of well-being, only to at the last be cast into hell for all eternity to endure the ultimate loss of conscious well-being. There’s loads more in this story, but the message is clear, Seek Christ and His Salvation as the ONLY Saviour and rescuer of sinners. …he bowed his head and gave up his spirit. I’ve had this is my drafts folder for a good while. Thought it was time I posted it. …he bowed his head and gave up his spirit. These remarkable words are from the Gospel of John chapter 19, verse 30. 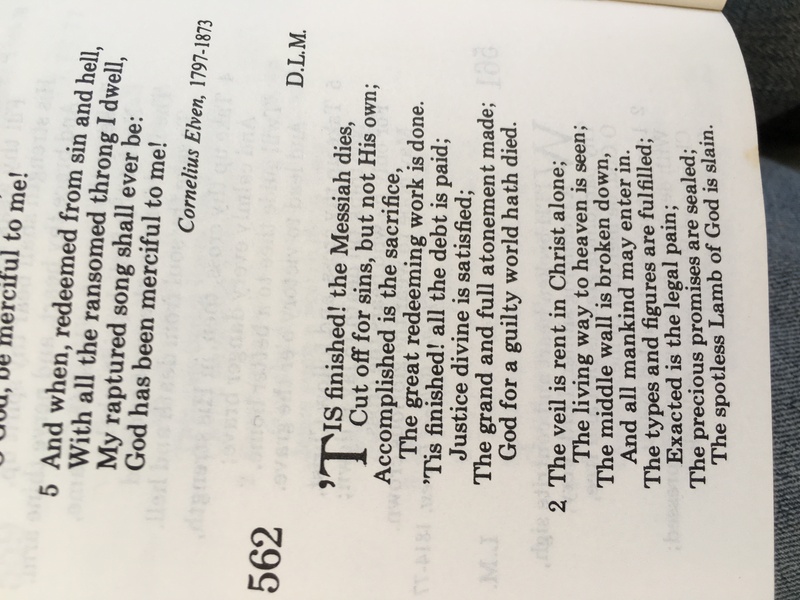 They follow on from three other remarkable words ‘it is finished‘ found in the same verse. In the annals of history was there ever a more horrific means of death designed to inflict maximum pain and suffering on another human being than Crucifixion? If you have seen the film Spartacus you will remember the defeated slave army suffered the crucifixion of 6000 captured men at the hands of the Romans. The Romans were expert at Crucifixion. In Jesus’s day under Roman occupation this was the ultimate degradation and death. To those sentenced to death by crucifixion there was no going back, it was a one way ticket to the after life. [And He bowed His head] This is the action of one dying. When the will ceases to exercise power over muscles and nerves, at once those parts of the body which are not rigid like the bones, collapse and fall in any direction to which the centre of gravity inclines them. The head of a crucified person would naturally in death droop forward on the breast, the neck being no longer kept stiff by the will (my emphasis). This is what seems to have happened in the case of our Lord. 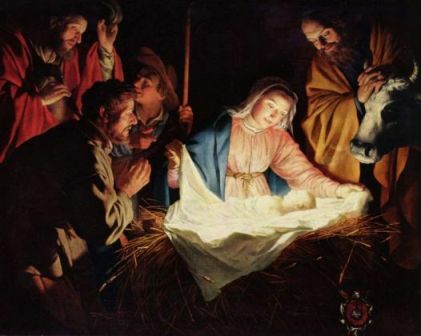 May we not gather from this expression, that our Lord up to this moment held up His head erect, firm, steady, and unmoved, even under extreme pain? Alford remarks how this little incident was evidently recorded by an eye-witness. The miraculous darkness must have now passed away, in order to let this movement of the head be seen. J. C. Ryle ‘Expository Thoughts on the Gospels’ John: Volume III, James Clarke & Co. Ltd. p. 363-4. This is extremely powerful. Jesus drank to the dregs the fullness of the wrath of God right up until when He could say those amazing words: It Is Finished. By an act of His loving will He fully purposed to consciously bear in His own body the full weight of God’s wrath – even for my sin! In the Greek ‘it is finished’ is the one word Tetelestai and is always used when something is completed. The root of the word is Telos, end. From Strongs numbers G5056; to end, that is, complete, execute, conclude, discharge (a debt): – accomplish, make an end, expire, fill up, finish, go over, pay, perform. There were many words that He could have used but He used this one (Tetelestai ) to proclaim the work of Salvation is done, complete. What this gloriously means is that there is nothing, nothing at all the sinner need do, but come. There is nothing to add to the work of Christ – all is done. Sinners need bring nothing but their sin. Not only is there no need to bring any good works but it would be an insult to Christ after having done all on the cross and then to contribute our pathetic so-called good deeds. No matter where you find yourself in life, no matter what you have done – you, you, may come to Christ for forgiveness and full Salvation. Now that’s what I call good news!! Then, and not till then does the work of sanctification begin – not before.